In its homeland, a Greek salad is simply a tasty chunk of creamy feta cheese served over a bed of sliced tomatoes and cucumbers that have been slathered with red wine vinaigrette and been further enhanced with a hefty pinch of dried oregano and perhaps some olives. This delightfully refreshing salad is a classic, and the Greeks have a word for it – horiatiki salata (ho ree ah tee kee). Horiatiki is popular worldwide because of its special tart, salty and slightly crunchy finish. Here at home, people change it up a little. A nice addition is garbanzo beans and adding macaroni adds a nice texture. You could make a meal of it, but I like to adhere to tradition and not add too many things. My personal favourite Greek pasta salad is listed below. If you are going on a picnic, visiting people for a weekend get-together, or having a backyard barbecue, Greek pasta salad is a convenient and flavoursome dish you can assemble quickly and bring to the gathering. It is a lovely summertime hot-weather dish. Just remember to leave it in the refrigerator for at least a couple of hours to marry the contents well. Then, bring a taste of the Mediterranean to the party. In a dry skillet, over medium flame, toast the walnuts for one or two minutes, being careful not to burn. When lightly toasted, set aside to cool. 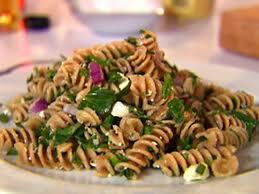 Stir the vegetables, walnuts, feta, herbs and drained rotini in a large bowl. Mix the oil and vinegar with salt and pepper. Pour over the vegetable contents, stir to distribute thoroughly, and then chill, covered, for at least two hours. Had a version of this last week. YUMMERS! Had this when I was in Greece. It's delicious, my kind of meal. It is very attractive salad. I hope you're working on a book with a collection of these recipes, Anthony. Or did I miss it? Do you have a cookbook out already? DIEGO: They call it HORIATIKI. JOANNE: Thank You, blessings back at ya. KINGRPG: Yes, appeals to the eye and tastes good. SHELLIE: You didn't miss it dear, trying to put it together. It looks great; and salad is perfect for the summer. I am a FETA FREAK!!!! Here, they also have this cheese called Tranche du Soleil. It's the French version of Feta-- a little milder, and delicious! And, yes, jardin is garden, but le potager is the area sectioned off for the veggies/fruits. Every single ingredient in this recipe sounds great. I am going to try it next week (need to hit the grocery store first). BTW...thanks for checking in on Zane. You are very sweet. Everyone loves pasta salad. This one with a little protein in the form of walnuts will make a complete delightful meal. GOLDEN EAGLE: Yes, salad is a good hot weather dish. SAMANTHA: I love those french double cream cheeses like brie. I have a le potager. SUSAN: I hope you enjoy it. And, best wishes always for Zane. MANZANITA: I try to use walnuts a lot because they have omega 3 fats, which are hard to get if you don't eat much fish. I do, but my BW not so much. I can tell you that my Dad, Anthony Stemke is THE BEST COOK ON THE PLANET!!! I wish he was on FOODTV!!! CHALIELLEN: Thank You Chali for those kind words, I appreciate it. I had that tonight! It was fantastic! AL:I agree with you, it's a great hot weather dish. i love greek salad and that's something we usually order without second thoughts from the restaurant menu. We usually go for the salad minus the cheese. For some reason, we are not big cheese lovers. Your version with pasta sounds like a delicious and filling twist! PLATEFUL: I'm happy to hear that you like the Greek pasta salad. Love the combination of pasta with some of my favorite Greek flavors...I have some whole wheat orzo on the shelf that this will go perfectly with. Thanks for the wonderful recipe and inspiration! yum, I love Greek salad. I like the idea of putting pasta with it. LUV'N SPOONFULS: The orzo will go perfectly well as the pasta in this salad. Thank You for calling. Lynda R Young: You will love this version of Greek salad. Thank You. Looking for a dinner solution-this may be it! That looks great, perfect on a hot day! Thank you for your kind comment on my blog. JOYCE: Good solution for al fresco dining. Thank You. CONNIE: You are correct! And you're welcome. Anthony - Greek Salad and Greek Pasta Salad are among my favorites. I never thought of adding walnuts to it! Thanks for the tip. I am going to try that out tonight. I think you should be on FoodTv, too! How do we get you on? MAEVE: Greek pasta salad is good. I don't know about FoodTv;with my looks I should be on am radio, except my accent is too thick. CM. Anthony, this looks delicious! I think I'll be adding this to my menu for the weekend! I think I'll stick to the more classic Greek salad and eliminate the pasta--not that I don't like pasta--but trying to adhere to a more traditional Mediterranean diet. Thanks for the recipe. Salad looks great. With the abundance of bell peppers and cucumbers everywhere now, this is on the "must try" list for me. KESHA: Please do, you will love it. L.L.Woodard: I think I know what you mean, you want to avoid over-consumption of carbs. Good idea, in the Mediterranean, the pasta course is a smaller volume than one here in USA. VARDHINI: Thank You, I appreciate your positive comments. AVERI: Thank You for calling. This is a good hot-weather dish.